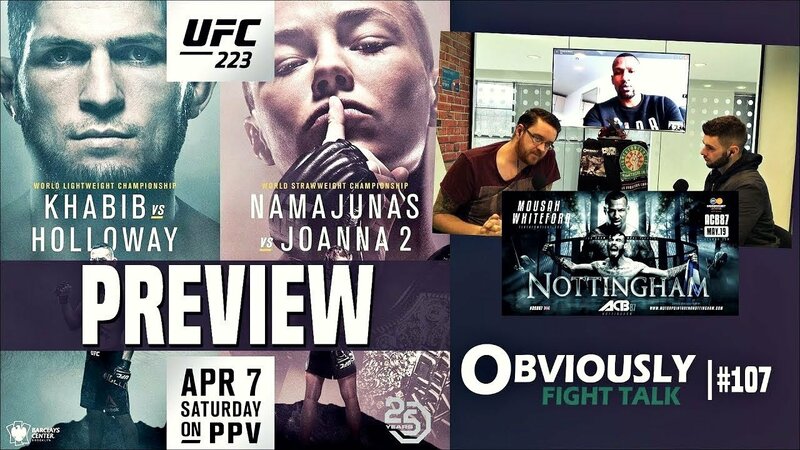 We preview and predict UFC 223 now headlined by Khabib Nurmagomedov vs. Max Holloway for the UFC lightweight title. Brendan Dorman joins us to break down the fights, make our predictions, and react to Tony Ferguson’s withdrawal from the main event. We interview ACB 87 headliner Kane Mousah who speaks about his main event against UFC veteran Robert Whiteford in Nottingham. We also introduce a new segment- This Week in MMA History – where we discuss Chuck Liddell vs. Tito Ortiz which took place at UFC 47, 14 years ago. UFC 223: Khabib vs. Holloway goes down on April 7th, 2018, at the Barclays Center in Brooklyn, New York. It also features a UFC Women’s Strawweight Championship rematch between the champion Rose Namajunas and former champion Joanna Jędrzejczyk. ACB 87 takes place Saturday, May 19, 2018 at the Motorpoint Arena in Notthingham, England. It’s headlined by our guest Kane Mousah vs. UFC veteran Robert Whiteford.